How to restrict the user to allow only one checkbox of each checked? – Another Salesforce blog!!! 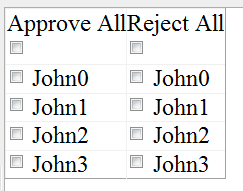 i have a two columns (approve all/reject all) how to restrict the user to allow only one checkbox of each?